Might. MIGHT. I’ve been burned before on this one, so I’m having a hard time believing it. 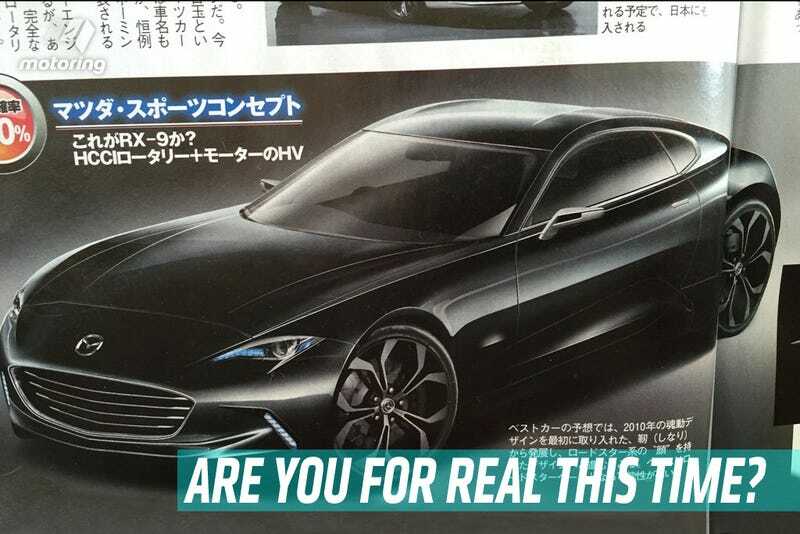 But Australia’s Motoring, citing reports and the rendering you see above from a Japanese car magazine, claims the mysterious concept sports car Mazda will unveil at the Tokyo Motor Show could have a rotary engine after all. I hereby instruct you to take this report with a gallon of salt and keep in mind that even if this sports car concept has a rotary, there’s no guarantee of production. The roadblocks to the rotary engine in today’s automotive climate are many, thanks to its issues with fuel economy and emissions. But Motoring’s report—which says the concept is more of a modern Cosmo Sport than an RX—says it could feature the long awaited 16X rotary engine, possibly with a turbo and possibly with a hybrid setup and 450 horsepower. Seems optimistic, to say the least. According to our sources, driving the e-turbo will be a capacitor (a unit that stores power and discharges it on demand) to beef up the rotary’s ‘instability’ at low rpm, while a conventional exhaust gas-driven turbocharger will engage to keep the flow of power coming as boost rises at higher revs. To improve fuel economy and emissions, Mazda will incorporate homogeneous charge compression ignition (HCCI), which as we’ve reported will be the centerpiece of the second-generation SKYACTIV powertrain suite that will power the company’s seventh-generation model range also due to appear around 2017. Fascinating, high-level stuff. But it seems unlikely for production. Mazda’s CEO even said in 2013 that the only way they’d bring back the rotary is if they found a way to make it commercially viable. But maybe things have changed. Despite being tiny compared to rivals like Toyota and Honda, Mazda’s actually doing pretty well right now, and they have some pretty outstanding sedans, hatchbacks and crossovers making up the bread-and-butter in their lineup. Maybe they’re ready to take a crazy risk. Maybe. Just maybe. I’m eager to see the concept, whatever is under its hood, but I don’t want to get my hopes up too much.